Unfriend List is an application that might seem useful for those people who have an account on Facebook. The program says that users will be able to find out who has deleted them from the list of friends very easily. In addition, this program should help you manage your own list of friends. The program seems to be really beneficial, but you should not think that it is perfect because it is known to be an advertising-supported application (adware). In other words, this program shows commercial advertisements, and we do not even know whether it really acts as it promises to do. If you have found this application completely useless, you can erase it at any time and then install a similar but, of course, reliable program. All the necessary information about its removal will be provided further in this article. We cannot say that Unfriend List is a very bad program, but it might still act in an unwanted way. Researchers working at pcthreat.com have noticed that Unfriend List will not only generate ads that might redirect to suspicious websites, but will also record various details associated with your activities on the Internet. Research has shown that this program is interested in your browsing details and approximate geo-location. In addition, it says that it “may automatically collect the information about your use of our Site, Services, Software, or Applications.” There is a small possibility that this program will connect to the Internet without permission too because it has to share the collected details with third-party advertisers in order to provide you with relevant commercial ads. If you delete this program from the system, it will, of course, stop performing activities, so if you do not like something about this adware program, you should get rid of it without further consideration. This advertising-supported application cannot be downloaded from its official website at the time of writing. If you click on the “Download To See Your List” button, you will notice an error immediately. Even though it is not so easy to get this program, it is still really prevalent; thus, we believe that it travels bundled with other programs and might enter the system without a user’s permission. 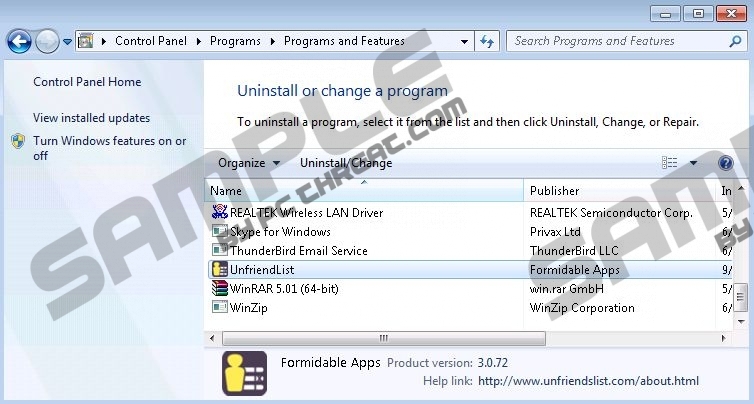 If you have also detected Unfriend List on your PC, but simply cannot remember downloading it yourself, there is a possibility that this program has slithered onto your PC without your consent. There is also a huge possibility that it has entered your system together with other programs. It is very important that you delete all undesirable programs from the system as soon as possible because they might not allow you to use your PC and they might even download other suspicious programs on your system. You can easily delete Unfriend List from the system because this program can be easily removed via Control Panel. If this still does not say much to you, you should use our manual removal instructions (see below). Another way to get rid of this adware is to scan the system with an automatic tool. If you have found it really difficult to decide which tool to install, you should definitely invest in SpyHunter. This tool is really powerful, so it will erase all the existing threats and will save your PC in the future too. Open the menu and select Control Panel. Launch RUN and enter Control Panel. Quick & tested solution for Unfriend List removal.